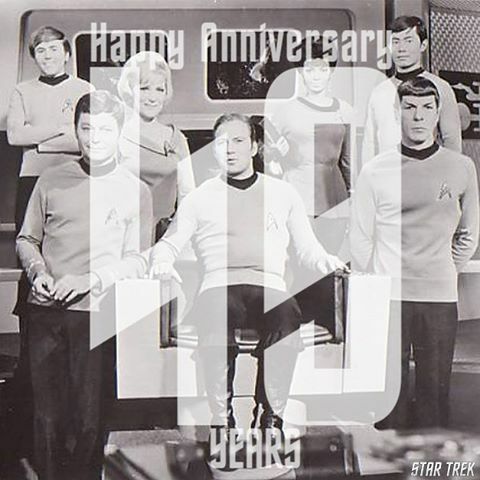 On September 8th 1966 Gene Roddenberry’s Star Trek released it’s first episode “The Man Trap” Starring William Shatner as Captain James T Kirk, Leonard Nemoy as Mr Spock, DeForrest Kelly as Dr. McCoy, George Takei as Sulu and Nichelle Nichols as Uhura. This was in fact the second Pilot for the series after “The Cage” was shown to NBC in February of 1965 with Jeffrey Hunter as Captain Pike leading the USS Enterprise. However it was September 8th 1966 that lunched the series to the public. Key cast members like James Doohan’s Scotty only appeared in voice not appearing on screen until the next episode. Walter Koenig‘s neclear wessel loving Chekov didn’t appear until Season 2, Epsidoe 1 “Amok Time”. Brought in to attract a younger audience to the show and give girls a Davy Jones type love interest.